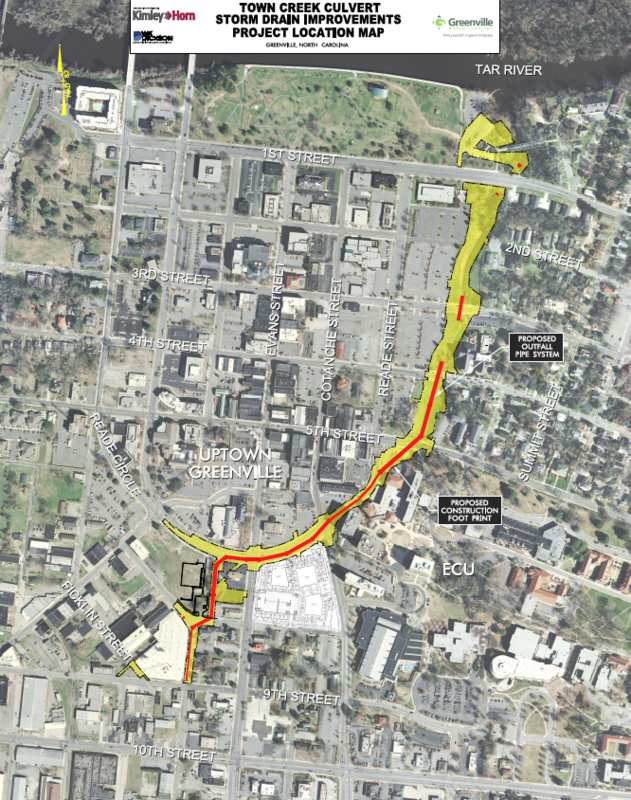 This page is to provide details about the impacts of the Town Creek Culvert Project on street closings, parking, and accessibility in the Uptown Area. Check back in for updates on the project and for relevant links for more information. The Town Creek Culvert, which runs from West 9th Street and Ficklen Street to its outlet between Reade Circle and South Summit Street, drains water from approximately 250 acres in Uptown Greenville. Over the past five years, there have been increasingly frequent problems with pavement failures and flooding at the intersection of Cotanche Street and Reade Circle connected to the deterioration of the culvert, and the load of storm water will only increase with the opening of the nearby Tenth Street Connector. To address these problems, the Town Creek Culvert is undergoing an upgrade, in conjunction with several green infrastructure projects to improve the livability of the area. Construction began in March 2018, and is expected to last approximately 30 months. Construction on 4th Street was completed and reopened to traffic on February 20, and work on the East 5th Street portion of the project began on February 25. Currently, 5th Street just east of Reade St is closed to vehicular and pedestrian traffic. This closure is expected to last until mid-summer. 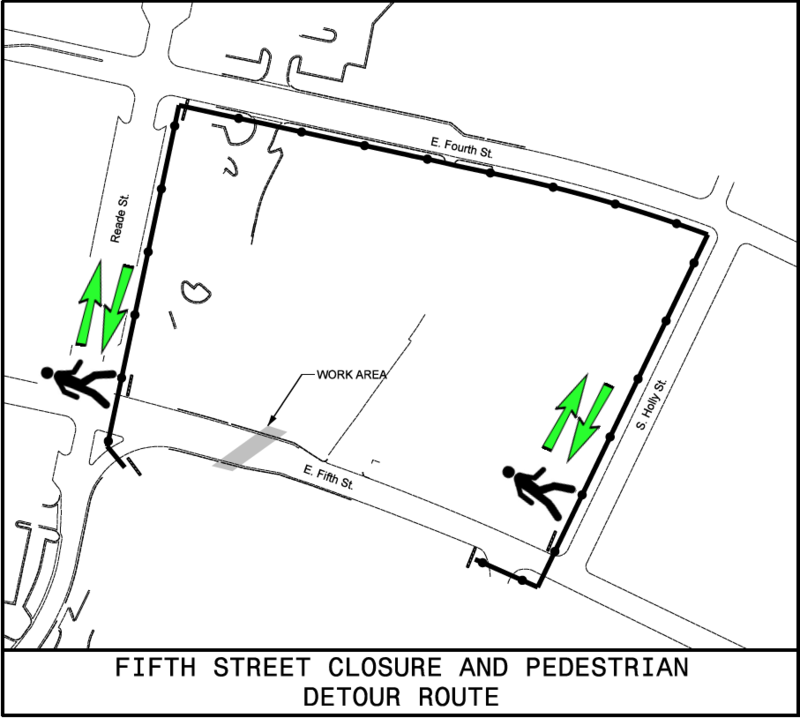 Pedestrians will be detoured onto East Fourth Street, while vehicular traffic will be detoured onto East First Street and Elm Street. Utility work on Reade Circle and Washington Street is scheduled to begin in the near future, and Reade Circle is scheduled to close to vehicular and pedestrian traffic in April. 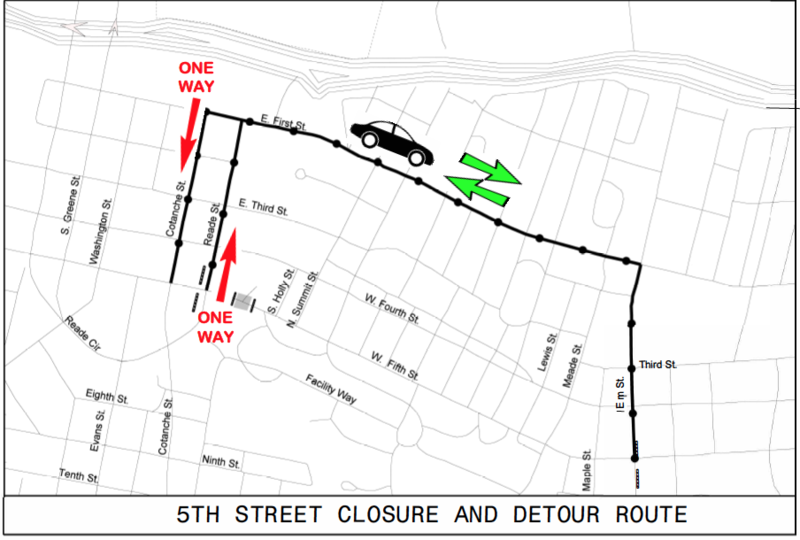 Once utility work is completed under East Fifth Street, the installation of the reinforced box culvert (RCBC) will begin, and then work will continue to move south. If you have a specific question or comment, e-mail your request to towncreekculvert@greenvillenc.gov. If you would like to receive regular email updates about the project, just send a request to bletchworth@greenvillenc.gov.